Historians have described the famine relief work accomplished along the Volga River during the years 1921-1923 as the most outstanding act of charity ever performed by the Volga Germans now living in the United States. George Repp was one of the leaders who organized the Volga Relief Society and is one of the greatest humanitarians among the Volga Germans. George was born in Norka in 1886 and family history can be traced to the original colonists who settled there. When he was five months old, his parents, Konrad Repp and his wife Anna Maria (née Weidenkeller) immigrated to the United States. Konrad Repp died on August 13, 1916 and the operation of his well known grocery store in Portland, Oregon passed to his sons, George and Adam. The grocery business was renamed Repp Brothers Grocery and Meats. In 1921, the Repp's began to learn about the worsening conditions in Russia as the result of the Bolshevik Revolution and resulting Civil War. The Volga Germans were among those forced to give up their seed wheat as a result of what was known as "requisitioning," or the confiscation by Soviet authorities. Then in the fall of 1920 and 1921, crop failures occurred along the Volga, and one of the greatest famines in many years set in. The natural causes of Russia’s distress in 1921-22 were the same as those of thirty years earlier—a blistering drought, followed by an unusually cold winter —but now these were starkly assisted by the aftermath of World War I and the civil war between the Reds and the Whites. The loss of millions of peasant farmers who had gone off to serve and die in the various armies had already reduced grain production by twenty-five per cent, and the Bolsheviks’ ruthless policy of “military communism,” whereby food was forcefully taken from the peasants whenever necessary, further interfered with normal production: there was, in effect, an agricultural strike. Transportation also broke down severely, pestilence swept across the land, and the Communist leaders saw their social experiment threatened by economic paralysis and starvation. Given that foreign newspaper correspondents were not allowed in Russia at this time, little was known about the famine until an article in the Literary Digest on August 6, 1921 was published. The article is titled "Millions Starving in Lenin's Paradise of Atheism." George and Katherine Repp were subscribers to the Literary Digest and the article had a great impact on them. The Repp's felt an urgent need to form an organization that would send food aid and clothing to the Volga German colonies. Their plan was then discussed with Katherine Repp's brother, John Miller, who enthusiastically embraced the idea. There are approximately fifteen hundred people in Portland that came from German colonies located in Russia near city of Saratov along Volga River. These people are anxious to help get food into that stricken district of Russia. They have received letters from relatives appealing for help. Will you be good enough to wire us how to proceed. That is, can we send money to you and designate that it is to be spent for food for a certain colony. Also have you any idea when relief work and food distribution will begin in Russia. There will be a mass meeting Thursday evening among our people and a regular relief committee organized for German speaking colonies in Russia. We would like very much have your reply by then giving us all information you can that may help in the organization. Have hopes extending work of this committee to other places where our people are located in California, Washington, Idaho, Montana, Colorado, Dakotas, Nebraska, Iowa, and Kansas. We figure that there are in the United States approximately hundred thousand people interested in these German speaking colonies along the Volga River and that good work can be done with proper help from reliable source like yourselves. Would it be possible for us to send an American citizen of our people into these colonies in Russia through your committee? That is, be indorsed by you or even sent by you as one of your workers so that he would have proper protection. A response from Edgar Rickard of the A.R.A. was sent to John Miller accepting the offer of assistance from the Volga Relief Society. On August 23rd, after the formation of the society in Portland, John Miller sent a letter to every German Congregational Church in the United States and Canada which were nearly all German speaking people from Russia. As a result, similar gatherings were held by Volga Germans living in Fresno, California and in Lincoln, Nebraska. Before long money was contributed by communities in Colorado, Washington, Montana, Oklahoma, Illinois, Kansas, and many other states in which the Volga German people had settled. George's decision to assist with the relief efforts in Russia was a significant personal sacrifice. In his mid 30s, he would leave his family and business interests for one year and subject himself to considerable health and physical risks during that time. George spoke the German dialect of his parents and neighbors from Norka, but sources indicate that he needed an interpreter to communicate with Russian speakers. During the first week of September 1921, a meeting in honor of George was held at the First German Congregational Church (Ebenezer) where 154 people pledged $1,250 each month for one year to support the relief work. Judge Jacob Kanzler was the first to address the capacity crowd in the church. Rev. George Zocher then made an address dedicating George to his work in Russia. George was appointed to join retired Army officer, Col. William N. Haskell in Russia to take charge of the distribution of aid contributed by the Volga Relief Society. The Portland Chapter of the Volga Relief Society had raised $18,000 at this time. Col. Haskell was in charge of the ARA's Russian operations and had traveled to Russia in early September according to a report in the New York Times. George left Portland on September 9, 1921 and traveled to New York where he filed his passport application on September 14, 1921. 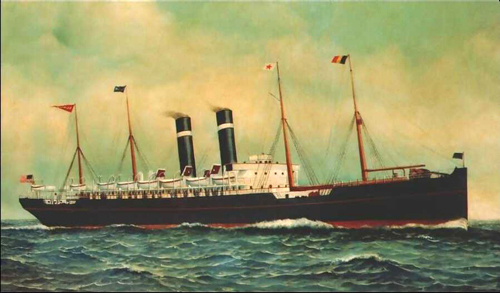 According to an article published in The Oregonian on October 4, 1921, George sailed from New York the prior week on the SS Kroonland bound for London. On the voyage, George met the former governor of Indiana, James Putnam Goodrich, who was sent to Russia as a personal representative of Herbert Hoover. 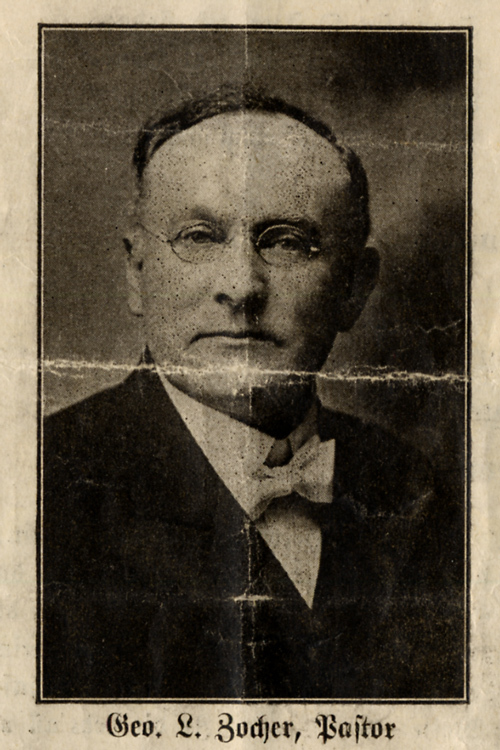 Governor Goodrich was to send a report directly to Hoover on the situation in Russia. During the 11 days it took to cross the Atlantic, George and Governor Goodrich had many opportunities to talk about the conditions in Russia. As a result of the conversations with George, the Governor developed a keen interest in the Volga Germans. After their arrival in London, George and Governor Goodrich met with the European A.R.A. Chief, Walter Lyman Brown. Brown had recently negotiated with the Russian government for permission for the A.R.A. to work without restrictions in the Volga region. George was asked if he would sign a contract to become a member of the ARA staff. This was a surprise given that George expected to fully cooperate with the A.R.A., but not be one of their staff. It was also a great compliment to George's capabilities and eliminated the need for the Volga Relief Society to pay his expenses as long as he remained in Russia. Two days after their arrival in London, George and Governor Goodrich departed traveling from Dover, England to Ostend, Belgium and then across Germany to Riga, Latvia which was then a primary point of entry for foreigners seeking access to the Soviet Union. On October 4th, the train crossed the border between Latvia and the Soviet Union at Sebesh (Sebezh) and the A.R.A. representative were subjected to a tedious customs interrogation and then were told that there was no room for their baggage on the train. In order to keep their baggage with them, they were forced to pay bribes to the Soviet officials. Subsequent to the payment of bribes, room for their baggage was miraculously found! George took a train from Moscow to the city of Samara on October 10th. At that time, no kitchens had been opened up for the colonies south of Saratov. George began to hear and read terrible stories about the suffering brought about by the famine and he was eager to reach the Volga German colonies. The first thing we saw was from fifteen hundred to two thousand people on the banks of the Volga, without food and in rags, mostly Germans, and all bound for somewhere, none of them knowing really where they wanted to go, but just to get away. Everything they possessed in this world they had with them; a good many were sick from exposure and hunger. They went about the city of Saratov picking up potato peelings, melon rinds, cabbage leaves, and in fact, anything that could be eaten. As fast as they could get transportation, either north or south, east or west, by rail or boat, they left. Poster of the American Relief Administration in Russia. George and Governor Goodrich were anxious to visit the colonies on the Bergseite (the western and hilly side of the Volga) and traveled by boat to the port town of Schilling, and from there to Balzer, Kutter, Alt Dönhof, and Norka where George was born. The men immediately noticed how unusually quiet it was in each village. The ordinary sounds of dogs barking, wagons moving and children playing were absent. Only a few people could be seen moving listlessly in the villages. Many homes were empty because the families had been killed during the Civil War or they had left to find food. George reported that since there was no fodder for the horses and livestock, people would remove the thatch from the roofs of the empty houses, knock out the dust, and then give it to the animals for food. As the thatch was 8 to 10 years old, the animals remained under-nourished. In each village, George and Goodrich would meet with the officials at the administrative headquarters. They would ask how many people had died that year, the amount of food on hand and the necessity for American aid. They found in every case that the poorest people in the communities had experienced starvation. George wrote that "it was very evident that 75% of the inhabitants would die before the 1922 harvest unless help came from the outside world. We found them at this time eating horses, camels, dogs, cats, field mice, bark of trees, and some people that had a little rye flour left would mix this with earth and eat it." After their return to Saratov, they provided a report on the conditions in the villages. The A.R.A. decided that the area inhabited by the Volga Germans was too large for one man to manage. Paul Clapp, was assigned to the east side of the river (the Wiesenseite) and George was assigned the west side of the river (Bergseite). On October 28th, all available food was loaded on ships and started down the Volga. George went on the ship to Schilling and Clapp went on the ship to Seelman. In a letter to his wife, George described this as one of the happiest days of his life. While in Saratov, George attended the German Lutheran church and noted the relative good health of the people in the city. 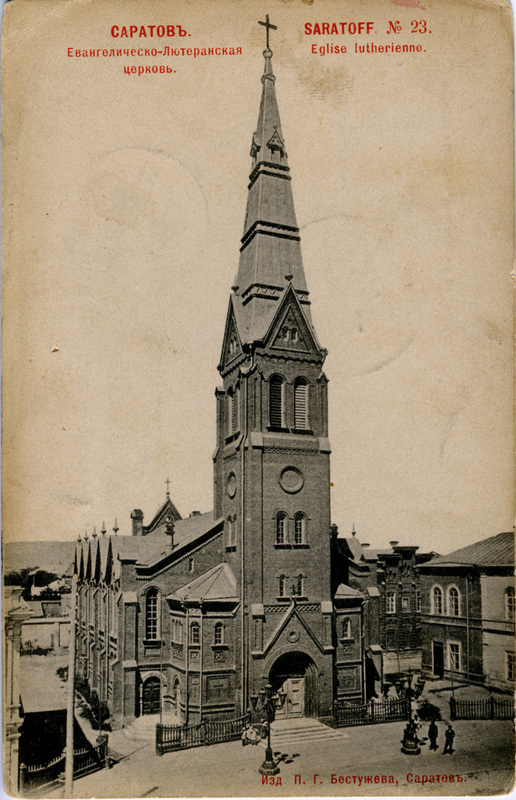 Postcard of the German Lutheran Church in Saratov. Courtesy of Steve Schreiber. George made arrangements to have food transported from Schilling and other river towns to the inland villages. It was difficult to find men with horses and wagons who were still able to work. In each town and village, a committee was formed to perform the feeding of the children and to take charge of the kitchen. The committee usually included the Vorsteher (head of the village council), Schreiber (secretary of the council), pastor and doctor, if there was one. Armed guards were always stationed around the warehouses in the harbor towns and interior villages. The poorest children in the villages were fed first and it was sometimes difficult to persuade the better off inhabitants to assist in this task, but as a whole they were glad to serve, even if their families did not directly benefit. After some delay, the first kitchen opened in Schilling on November 2nd and about 200 children were chosen from the poorest families. George tells the story of a little boy who asked wistfully, "Uncle, when WILL the kitchens open? ", and upon being told that they cooks were a little slow, he suggested, "Let's throw them in the Volga!" George reached Norka on November 7th and organized a committee of 13 men who would organize the kitchen and feeding. The kitchens were set up in the two school houses of the village and the schoolteachers summer kitchen. Soviet officials saw to it that wood, water and utensils were on hand. In three days time, enough food had arrived from Schilling to last for six weeks. There were over 2,000 children in Norka and only 500 could be fed the day the kitchens opened. According to Pastor Wacker, the most difficult task was to pick out the children who most needed the food. Sometimes one child in a family would be chosen to receive food, while his siblings were not. There was strong competition among the women in the villages to be cooks, which brought no pay, but did bring a double portion of food each day. On November 14, the three kitchens in Norka opened and a great chaotic rush of children poured in with an admittance card, a spoon and a plate. The experience in Norka was typical for most of the German villages. Repp worked with great speed and by December 2nd he reported that they were feeding 9,085 children in 24 villages. Arrangements had been made to open kitchens in the 59 remaining German colonies on the Bergseite and that soon 30,000 children would be fed. In a letter to John Miller dated February 13, 1922, George reports that they are feeding 35,000 souls on the Bergseite and by February 24th, they will be feeding 40,000. George also reports that there will soon be enough food to begin feeding adults. In addition to feeding the most needy, seed grain was provided in hopes of creating a successful harvest in 1922. Clothing was also provided to the extent possible. Their oldest daughter married schoolmaster David Borgardt from Schwed on the Wiesenseite. Similar letters of frustration were lodged against Pastor Wacker, Jacob Volz and the National Lutheran Council. I will begin my report with warmest thanks to you my dear German brothers in faith, in the name of our village and from me, the deepest and warmest thanks for your faithful and compassionate remembrance of us in your sending over so many loving gifts of food and clothing which we received through your representatives Mr. Repp, Pastor Wagner and Jakob Volz. We are thankful that these representatives came to us with great love. We, who were saved from starving to death will in our lifetime not forget what you dear brethren and your representatives have done for us. The American Relief Administration corn has landed. An enormous amount of this corn has gone to our German people, the Bergseite colonies alone getting 45 carloads with 1,000 pood to the car (note: a pood is equal to about 36 pounds) . I have sent orders to all the colonies, some of which have already got their share and the balance will get theirs soon. I am expecting a boat load of food for the kitchens very soon. Have wired Saratov and received the answer that as soon as possible it will be sent. The personal food drafts are coming fast but not enough good has arrived in Saratov to fill them. I have hope that food will come in great quantities soon, so that the food drafts that are now waiting may be taken care of, and the in the meantime, dear friends, do not give up sending more food drafts to your relatives. Keep them coming. The weather is good, the snow is gone and the roads are almost dry. It is getting quite warm, in fact I believe it gets very hot here in the summer. I am already sunburned. Advise people that the postal department does not accept "International Coupons." A good many people write their friends to send letters without stamps that they will pay in the United States. That does not work. The postal department either destroys the letters or returns them. Also inform everyone to write the return address on their letters plainly. I address a good many letters for people and many times cannot read the return address in the United States. This is important. Regarding conditions there isn't much that I can add to what I have already written you. Death is surely reaping a harvest. Over 300 have died in Balzer since January 1st, 1922. The Monday after Easter, 10 people were buried that day in Balzer. the pastors and school teachers are undoubtedly writing you regarding conditions in their colonies, so you can see from their letters just how things are in each colony. A lot of misery, hunger and dissatisfaction on all sides yet. I have been waiting for Rev. Wagner to come from Saratov to take my work over and then I will go to Saratov and handle the balance of the Volga Relief Society fund. I think that will be disposed of quickly as it will amount to about 100,000 pood which doesn't amount to much in this land. We figure everything by the thousand pood. I have not received any mail in four weeks on account of roads. In fact there are were no roads here. Not a paved block outside of Saratov. My next letter will be from Saratov. According to a letter from Pastor Wacker from Norka published in Die Welt-Post on August 24, 1922, George had achieved significant results in a short time period under difficult conditions which saved thousands of lives. As our dear friend, Mr. Repp, begins his journey homeward in the next few days, I want to take the opportunity to write a few lines. I am sending a tabular overview of the aid received by the village of Norka. As you can see from the tables, by far the largest share of aid came to us from the Volga Relief Society, and in particular from our dear Norkans in North America. This fraternal assistance will truly be remembered forever. As I write these lines, already many Norkans (and in other colonies) are eating their first fresh bread. Many could not have made it this far if a gracious God had not awakened your hearts and minds to come to our aid. May the Lord God repay you all the love you have shown us. Now we are experiencing the new harvest. It promises to be, if not as good as it seemed at first, but (I can report for the Norka Parish) the farmer will have his daily bread. Much depends, certainly, upon how much the government will take in grain taxes. In addition, much will depend upon the general situation. As long as conditions in Europe do not return to normal the best of harvests will do nothing to help Germany and Russia from their untenable situations. Would that it be otherwise. I hope to write more from time to time. I ask that the enclosed information be sent to the newspapers. From 14 November 1921 to 17 December, 500 children were fed. From 18 December 1921 to 1 February, 1000 children. From 5 February to 17 April, 2000 children. From 6 May to 2 June, 2600 children. From12 June to 9 July, 2700 children. From 14 July on, 2765 children. (At present about 150 children are excluded from admission to the Kitchens as no necessity exists to add them). (75.23 Pud still retained in accordance with previous instructions). 2522 Pud of Maize distributed to 2350 persons from 16 April to 28 May. No vouchers as yet for the 4200 Pud of Maize for the period 29 May to 25 July. The Soviet Authorities supplied 400 adults for a period of about 4 months. Also support from Pastor Weigum of Appenzell, Switzerland is expected from Germany. Rev. Wacker reported a moderate harvest in 1922, which surely eased the immediate famine conditions. Nonetheless, conditions remained very difficult in the Volga German colonies for several years. While George must have felt satisfaction in the work he had accomplished, he surely knew that the problems of his countrymen were not completely resolved. Due to the Civil War and famine, thousands of widows and orphans remained in extremely difficult situations. Adequate clothing was in short supply and the buildings were in desparate need of repair. The National Volga Relief Society continued its work and held a convention in Portland at the Zion Congregational Church on June 12, 1924. The national officers were all from Lincoln, Nebraska and included H. J. Amen, President; John Rohrig, First Vice President; Rev. G. J. Schmidt, Secretary; and J. J. Stroh, Treasurer. 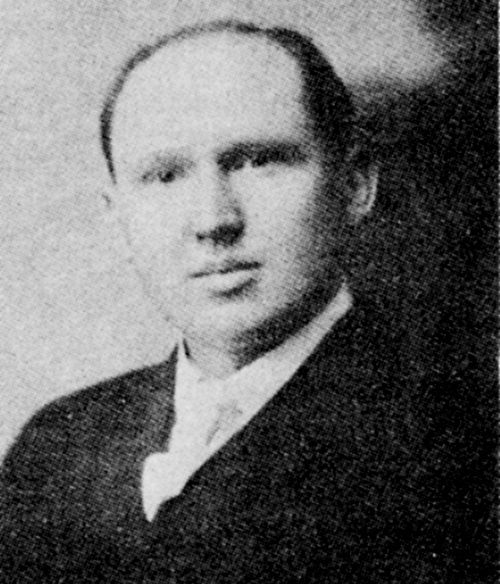 John Miller remained President of the Western Branch of the society The Oregonian reported that the meetings were held in the German language. Judge Jacob Kanzler of Portland and Rev. R. Kuehns of Lincoln, Nebraska addressed the convention and music was provided by the Zion chorus choir. In hindsight, it was very fortunate that George happened to leave on the same boat for London as Governor Goodrich where he developed a personal relationship with him. Based on what Governor Goodrich learned about the Volga German colonies from George, he made a personal survey of this area when he arrived. The sympathetic report on the Volga Germans colonies that Goodrich delivered in New York, caused the ARA to take much more interest in this group than they might have otherwise. George's ability to build trust and confidence with the ARA leadership and the community leaders in the Volga German colonies was equally important as his tremendous organizational skills. At its peak, the A.R.A. employed 300 Americans, more than 120,000 Russians and fed 10.5 million people daily. Despite their heroic efforts, approximately 170,000 men, women, and children died of starvation in the Volga German colonies alone (about one-third of the population according to Peter Sinner). Without the efforts of the A.R.A., the situation would have been much worse. 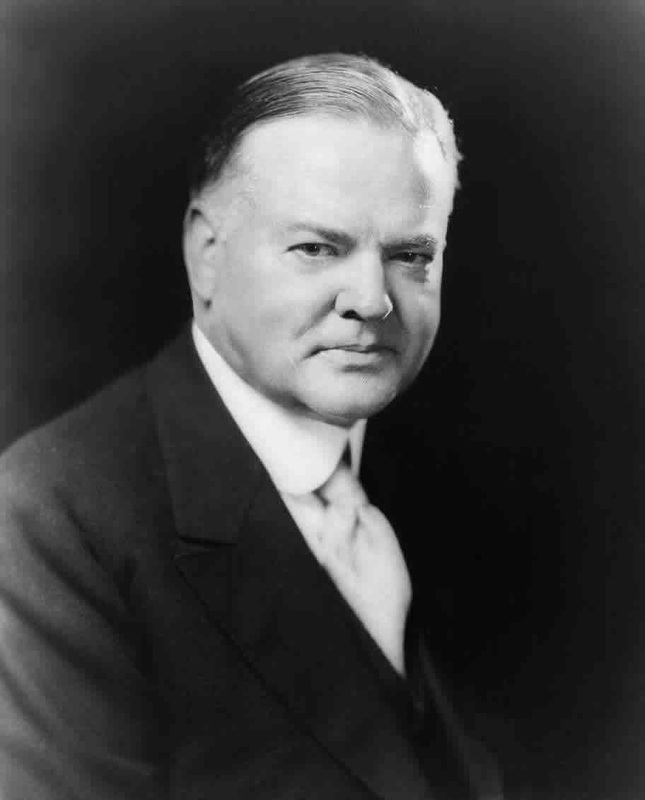 The appreciation of the work done by George Repp is expressed in the following letter written by American Relief Administration Secretary, Herbert Hoover, on September 14, 1922. The German-Russian people both in this country and along the Volga owe you a great debt of gratitude. The American Relief Administration realizes this perhaps more than your own people do, for we have seen the efficiency and devotion displayed in your work at first hand. I should like to express to you both in the name of the A.R.A. and myself, personally, our hearty appreciation and thanks. Article regarding Repp's work in Russia from "The Oregonian," Monday, September 25, 1922, page 6, column 1. The Oregonian historical online archive. Die Welt-Post (a German language newspaper published in the United States).